I have to share with you how wonderful it is to have a top notch children’s hospital in Hudson. My 3 year old cut his thumb playing outside. It took me 2 seconds to realize this is beyond super mom healing and we headed to Akron Children’s ER in Hudson. We had NO wait, NO hassle, nothing! The staff was quick to assess and begin treatment. He was given some pain medication and put into the best board ever made. Once his medicine kicked in we talked about how cars have 7 wheels, dinosaurs were walking in the parking lot, and counted his teeth while they stitched his thumb. The doctors and nurses even got a chuckle or 2 out of it. 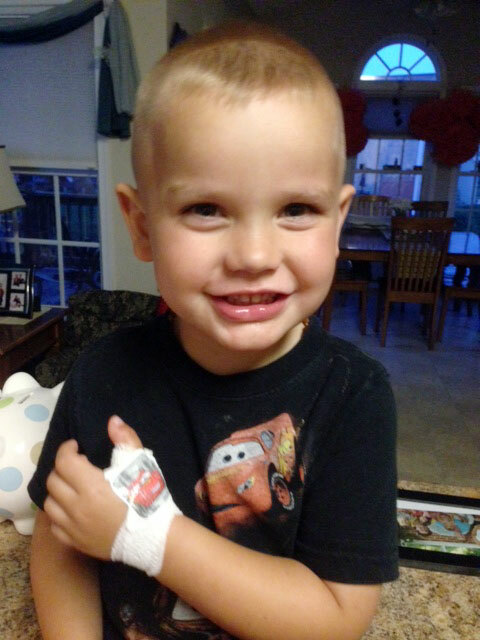 He left with a squirter, a bandaged hand, 3 stitches, stickers, and most of all, a smile. I just wanted to thank Akron Children’s for having the best care for my children. Thank you!